any RC airplane/drone fliers here? My dad was a pilot. He built his own airplanes (his last build was a Pitts Special). I have always wanted to become a pilot, but had neither the money nor the time. Plus, to make it truly worthwhile I'd have to own my own airplane, and that is definitely not happening. My dad also built and flew RC models. Walking the dog at a park about a year ago, I see electric ones are now available (I'm very behind LOL)... no gas, no smoke, quieter..... I became immediately interested! Last week I ran into a few guys (turns out they were the local RC club) flying at the local sports fields... in short, I think I might be getting my first RC for myself for my 50th birthday this year.... just wondering if anyone here partakes? Personally, I find drones annoying, but then I'm not a helo fan either LOL. But I LOVE airplanes, always have! Tried one once. It took off and just flew away. Never found it. I did the tether type decades ago when I was a kid. Crashed and burned repeatedly. I realize that those of you here are adult enough to play by the rules. Sadly, your hobby might become curtailed by idiots flying around airports and other places where they shouldn't be. Drones have amazing potential, yet when used by those looking for a laugh, can lead to some horrible ends. On another related thought, how do you feel about drones delivering goods? Porch pirates are bad enough these days. For as many good uses for drones, I can come up with just as many bad, evil uses. I do think that there'll be some federal controls being initiated in the future. I didn't but my brother did. He said it's best to start out with the cheaper planes, because you're gonna crash them when you first start out. He has these styrofoam WW2 planes that look and fly quite well. The modern electric motors are incredible. Dad made a couple of beautiful balsa planes in the '60's, one a free flight glider and the other a rubber powered plane that was amazing. I did finally make a balsa rubber-band powered P40, but it doesn't fly too well because the design isn't true to the material, balsa vs. metal. That Pitts plane is a beauty. I'm an RC guy, I have flown them since I was a young adult. We started out, like most kids, with the control line models (crash, rinse repeat). My brothers and I gradually gravitated to RC, I keep my skills polished up by flying computer RC models. If these computerized (and phone) Simulators had been around when I first began to fly, it would have saved me a lot of crashes. The technology is available now, so it's best to use it. I use "Real Flight RC Simulator" on my computer. I use a full size RC controller, that plugs into the USB port. Ruger9, I can highly recommend an Android and iPhone RC Simulator to start you out, it's "Advantage RC Simulator" at the Playstore or Apps Store. It is a remarkably lifelike simulator with all types of models available (even helicopters). Learn to fly on the simulator first, before you take your real plane up. These modern simulators are EXACTLY like flying the real plane, and can save a bunch of money by getting your pilots wings in pixels first.Tip: ALWAYS REMEMBER, when the model is flying towards you, always steer toward the low wing to level up! Helicopters are a whole different animal, they are ridiculously difficult to fly, and are best left to those with deep pockets, to pay for crash damage. If you have any questions please feel free to contact me! Actually, that's all now regulated by the FAA. You have to register and the aircraft must be registered, and you PRESUMABLY follow the rules, one of which is not not fly within 5 miles of an airport. This was never a problem until the drones appeared.... RC aircraft were not a problem for DECADES, but drones have made it a problem now. Thanks, drone guys. I did the tether type too... got old fast. I never did the RC, I was too young at the time. My dad was building a F4U Corsair out of balsa when he passed away. THANKS for the info on the simulator app! Will do! Luckily, the Carbon Cub kit comes with beginner features: you can set the controller to level out when you release the controls, auto-land, etc. So at least that should make learning easier. Ruger9, it sounds like a great model to start with. Please do learn to fly the Simulator before you take your new plane up, I think it's an amazing learning tool that will help you avoid a lot of trouble. I really wish they had been available to help me learn to fly (and more importantly, land). I use my Advantage RC Simulator all the time, it even has the option to trail smoke for added fun. I keep my flying skills honed with the simulator, I can't say enough good things about it. It has some really cool WWII aircraft as well as multiple engine and jet aircraft in addition to several training aircraft. That tip about "steering towards the low wing, when the model is flying towards you", was told to me long ago, by an old timer and has saved me many a crash. It's very easy to get disoriented trying to remember left is right and right is left, when the plane is flying towards you, "steering toward the low wing" is much easier to remember and to execute. EDIT : The Advantage RC Simulator comes with 1 free trainer airplane, 1 free helicopter, 1 free car and 1 free boat. $20 will unlock all 35 airplanes, and is well worth the price (it was one of the the best $20 I've ever spent). I've spent hundreds of hours flying every one of these planes, on multiple airfields. They each have very accurate flight characteristics, and represent a tremendous amount of R&D on the apps creator's part. My Dad built a huge B-25. It had a 6' wingspan. Crashed the first time out. He started building clocks after that. RC planes and drones should also need FCC licenses as well, if I'm not mistaken, or at least they once did. With TV and radio going to digital due to cellphones, the bandwidth has become more and more crowded. Even wireless mikes need FCC permits. We had to have them for all of the wireless units in our theater, including wireless ICOM. Ruger9, that Pitts biplane is gorgeous. I remember the old band days, before cellphones, when only CERTAIN wireless units required FCC licenses- those that operated on "military frequencies" or something... I seem to remember, only pros used them, and usually only when overseas. Or maybe they weren't allowed to use them overseas, not sure? 2015 the FAA regulated drones, but there's a "special rule" for hobbyists... it's $5 for 3 years, and basically just registers and aircraft (below 55 lbs) in your name. I guess it's just in case you cause trouble with it, they can trace it back to you. But it's much ado about nothing really- there's no tests or inspections or anything. It's just fill out a form and send in $5. 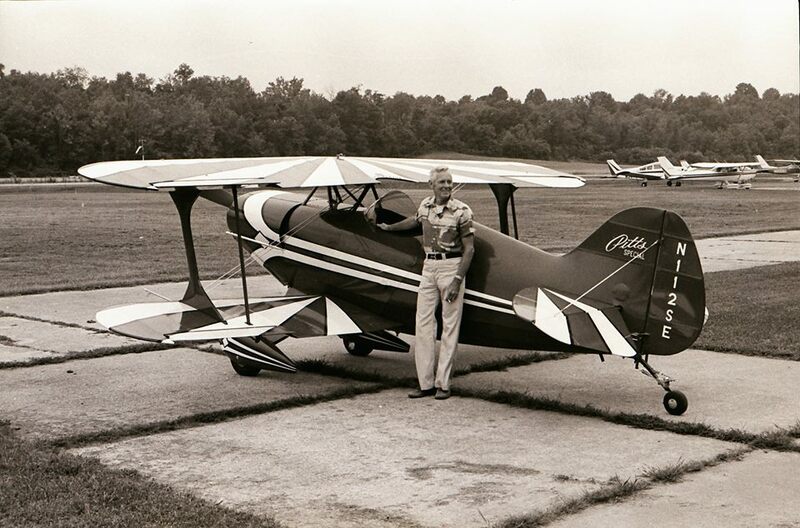 This is my dad with his 2nd Pitts he built. I don't have any color pics on my computer. He built them in the basement, from scratch (not a kit- it was from tubing & plans), then took them out the bilco doors and assembled the wings to the fuselage at the airport. He was sort of famous locally, as he was the only guy who could fly aerobatics in the region. Ruger9- That is so cool that your Dad flew, and flew aerobotics, no less! That's a great picture of him! Hats off to him for building his own aircraft! Wow! I can't imagine that was a common thing to do. I also think it's cool you're considering doing some RC flying. That would not only be fun, but a great way to remember your father, especially with a plane that is a model like his. I don't fly RC planes, but have some friends who do. I'd like to, but have too many hobbies as it is... I do often stop by Valley Forge Park where guys fly everything from planes to helicopters to drones. My one buddy who has gotten pretty heavily into drones and does freelance videography with them, was telling me there does seem to be some 'disdain' with drones by the old time RC plane guys. Needless to say, some of the RC model planes are just incredible. You can go down the YouTube rabbit hole of watching videos of them, along with many cringe worthy crashes. My daughter's father-in-law is heavily into rubber band powered planes that he builds. He also holds distance and time records from competitions. Here's a neat short film that he did (with his son providing the drone footage). Check his channel for other planes that he has built. Pretty incredible.. and all rubber band powered. I built a Grumman F4F Wildcat balsa wood rubberband powered airplane. It was every bit as intricate as an engine powered model. It had a tissue paper doped skin, and was very lightweight. I had that thing for years, until time swallowed it up. Those kits were a lot of fun, and were highly educational. I know all about fabric & dope.... I can't imagine trying to dope tissue paper!!! Impossible! Like walking the rice paper without tearing it on "Kung Fu"
Cool thread, guys. Thanks for the diversion. Other than rubberband-powered balsa stick planes of various sizes and a few minutes with a battery-powered tether toy, I haven’t indulged in flying model planes. Looks like an expensive rabbit hole - but I like seeing nice ones, especially in flight. Lots of wild adventures therewith. Tiny ones to big multi-stages. Camera in the nosecone. A fin sheared off one during a launch and it came around at us; we got out of the way and it ripped itself up going through a barbwire fence before burying itself in the frosty loam of the field behind my buddy's house. I think I recall we sent even a small mouse up once. Maika Mouse. Good times. In connection with dads building full-size planes to fly, I can’t help telling the story of a friend of mine, our local “sign guy” here. He and his dad had always wanted to build and fly a small plane. Dad got sick and that evidence of mortality scared them into getting started on a quarter-size WWII trainer from a kit. For a couple years they worked on it in the garage of the sign shop. I watched the progress from what looked like a light balsa frame to doping the fabric skin to installing what looked like a lawnmower engine to fitting the spindly tubular-frame-and-sretched-nylon seat. All very interesting. Before it flew, Gary’s dad died. During winter, I think. Come spring, Gary got the plane ready in memorium. He took it to a small local airport, got it up to about 70 feet - then it nosed over and crashed. Gary got a 4,000.00 helicopter ride to a Louisville hospital with a broken neck. Doctors didn’t know why he wasn’t already paralyzed, and were afraid to operate for fear of making it worse. A national specialist was summoned, who successfully fixed the injury - but during the testing and procedures they discovered cancer. The cancer turned out to be inoperable, and they sent Gary home in a wheelchair and a neck brace to do what he could with the year they gave him to live. He had never been particularly religious, and his graphic artist sorta girlfriend - who took him in and cared for him despite her own MS - was even less so, and with exuberant conviction. A local faith-healin’ fundamentalist preacher got hold of the case and started visiting Gary, praying around the bed and laying on hands with other saints of his congregation, terrifying him with the horrors of the afterlife, raising all the ghosts of his childhood religion, casting his misfortune as God’s hand of judgment, leaving him a quivering wreck - until, beat down, he let himself “get saved.” Then they promised Gary a healing, and for months as he declined, they doubled down, convincing him his faith just wasn’t strong enough. During all of this, his girlfriend seethed with fury. He died the following winter, and was buried on a grey day of wind and sleet in a little cemetery up a winding gravel-to-dirt lane off the 2-lane asphalt between our hometown and the location of the fateful airport. The preacher showed up to get in the last word as the box went into the dirt. Be careful with model airplanes. Not sure what to even say about that bizarre post, Proteus. How depressing. Well, the story wasn't intended to be bizarre. It's definitely only tangentially related - but your experience with your dad as a flier dredged it all up, and since it's too cold and rainy on the porch at Cracker Barrel today, I thought I'd just tell the story here. I guess I no longer think of it as depressing - or any more so than mortality in general. It just seems like a self-contained tale of both balance and injustice, and a reminder that we live in a universe where the former is always maintained - and which doesn't care about the latter. Just one of those things. As Billy Pilgrim would say, "so it goes." I did rockets with my kids when they were of the requisite age. One deployed a payload carried by a parachute, and to dramatize high (and far) hopes, we put our address in a note attached, just in case it caught a fair wind and ended up in an exotic locale. It landed five blocks away in the geode meditation garden behind the local rest home, and the finder kindly returned it. And as a reminder of a very different time, this Estes box (bought from JC Penney for 9.95, I'm informed by a tag on the end). Seems like a long time since we could find "Flammable Solid" and "Toy Propellant Devices" on a box found in the toy section of a department store. I'm still waiting for my Saturn V too. Tom Hallman is very VERY likely the finest rubber power modeler in the history of humanity. Some rubber power models of mine. A Peanut scale (13” wingspan) scratch-built Martinsyde S1. A Nieuport 24bis from a kit by Greg Thomas in Minnesota. I believe I am the only one to have ever built this kit. It is tricky to say the least.